We’ve been talking about the importance of meaningful, purposeful activities at the Bine. Activities that take the focus away from dementia, have an outcome, give a real sense of achievement. Back in 2015 I wrote an article, reposted here, about helping out on a local street-cleaning project. It was a perfect example of a volunteering opportunity where Lena, then still in the relatively early stages of Alzheimers, could re-engage with a world beyond dementia and make a real contribution to her community. But what about now in 2018, when Alzheimers has moved so much further along. Would she still enjoy being a dementia volunteer? Could she still contribute in any way? Yesterday I found out. There are some who lead a community, and others who serve. Then there are some special individuals who just glue it all together. People like Joe O’Malley. Joe’s our window cleaner. Every couple of weeks he comes to the door to get the key for the back alley gate – and we chat. He’s told us the history of our house – how the woman who used to live here was one of the first female bus conductors (remember them?) in Salford. I tell him we’ve got two dozen sacks of coal after cleaning up our basement, and he finds someone who wants to take them off our hands. We talk about our dementia project and he immediately reels off a list of people who might be interested. A few weeks back, he told us about his new scheme to clean up Salford. Volunteers take to the streets once a month armed with brooms and spades and grippers and plastic sacks. So the last couple of months Lena and I have gone along to lend a hand. I wanted to go because it’s Joe. And I wanted to go because it’s perfect for Lena. It’s getting out, getting active, companionship with other people, having fun … everything that she enjoys. But more than that, helping Joe and his team gives Lena the opportunity to show that even with Alzheimers she still has a role to play in the community … in a non-pressure situation where she feels comfortable. That’s a big win. Volunteer jobs like this can be a perfect way for people with dementia to stay connected, to feel they’re adding value. 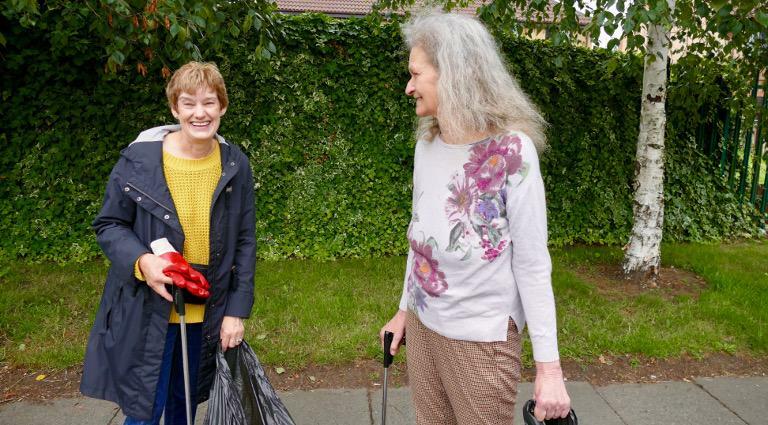 And if word gets out that some of our neighbourhood improvers are dementia volunteers – well, there may be no better way to make our communities dementia-friendly. As we walk the mile to the meeting-point, I’m explaining to Lena what we’re going to do this morning. She doesn’t understand a word, but she’s happy. For once, we’re getting moving straight after breakfast. Alan’s not sitting at the computer. She’s free. It’s just a small volunteer group today. Joe and three others. I’m delighted to see Gina Reynolds, our local councillor and one of the team of three I met at the Salford City Council on Wednesday. She’s the lead member on the Council for adult services, health and wellbeing. I do the introductions, and Lena steps confidently forward to shake hands and say hello – but in the gobbledygook only she understands. I’m her interpreter. – How’s your Swedish? Lena gets a bit muddled with her languages these days. Don’t you, Lena? She grins. It wasn’t Swedish – well, not intelligible Swedish anyway. But it doesn’t matter. They all understand what’s going on. And they’re not embarrassed. Good. Equipment distribution. And some shiny red protective gloves. Lena takes one and admires it, but I’m sure we’ll never get it on. I try, but she won’t unclench her fingers, and pulls it straight off. It’s uncomfortable. Not to worry. I doubt she’ll be picking up much anyway. But actually, as we get started, Lena’s a pretty good helper. I need one hand for the gripper, so it helps to have an assistant to hold the sack open for the things I pick up. I show her how. – Look, one hand here, and the other here … Not there, here, so the sack stays open. Hold it just here – no, not the gripper, the sack! Look, like this. That’s it. You’ve got it. Great! That really helps me. I must have repeated the instructions a dozen times as she struggled with the placement of her hands, forgot to remember to grip. Nevertheless, we made good progress for about 45 minutes, filled a whole sack. And Lena was willing. She wanted to do it right. A girl was coming towards us, pushing a pram, the hood edged with white fur. Now this was more interesting. Lena made a beeline for them. I watched. I saw the girl stop, smile … and then the look of total confusion on her face. Help was at hand. I strode across and explained – cheerfully. – Sorry. Lena has Alzheimers and she gets a bit muddled with her languages. I wouldn’t have been that explicit three years ago, but now I know that Lena doesn’t understand words – not at that speed and not unless I’m talking directly to her. She relies on facial expressions and tone of voice. Hence, cheerfully. And besides, it’s part of my mission to bring dementia out into the open – to put aside the secrecy and embarrassment, to normalise it. I peeked inside the pram. Unlike Lena, I don’t have a soft spot for babies, but this one was undeniably cute – tiny, with a big red ribbon tied in a bow across her forehead. A proud mother clearly. – Look Lena, a brand new baby! – How old is she? – So is this your first time out together? – Yes. Well, no, I took her home from the hospital …. And the girl was telling us her story, relaxed now as we street-cleaners gathered round to admire. Back to the questions we asked at the beginning. Did Lena enjoy being a dementia volunteer? Did she contribute? Let’s weigh up the positives and negatives and think about what we can learn for our Bine project. Can we – should we – offer volunteer projects like this to those with advanced dementia? It’s true that Lena was able to contribute far less than three years ago, and a few months from now she might not be able to help at all. And she was probably completely unaware that her efforts made a difference to the community. It’s true too that she needed my full-time attention. If this were a Bine project, we’d need to be sure that we had one helper for every person with advanced dementia. And like yesterday, we’d need to keep well away from traffic. But let’s look at the positives. Did Lena enjoy the morning? There’s no point asking her. She can’t vocalise her feelings, any more than she can remember them. But there are other ways carers learn to measure wellbeing. How often did she smile? Were there signs of frustration or boredom? Did she seem engaged with what was going on around her? Did she seem stimulated? By every measurement, I’d say that our three hours away from the house were a big success. But that’s not all. A few more people came into close contact with dementia, learning about it not from a course or by talking about the problem, but seeing it face to face. I hope they’ll have learnt that even people with advanced dementia don’t need to be shut away, can still function within normal everyday society, even if they need lots of help. And finally, there were big positives for me, the carer. Volunteering gave me a feel-good factor, and brought me out of the dementia cocoon, helping me to spread my wings and fly again. Days like this take the stress out of care. 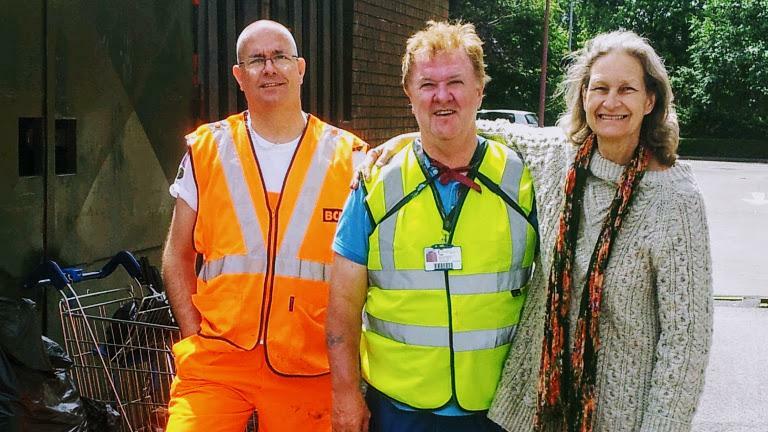 Your input Street-cleaning is just one example of community volunteering that can benefit people with dementia and their carers. What others can you think of? We'd like to add your ideas to our list of potential Bine activities. Then don't miss a post. Our weekly Sunday newsletter includes a digest of all the week's articles. We send out 3 weekly newsletters. On Monday it’s a summary of last week’s blog-posts. And then exclusively to subscribers, on Wednesday it’s Carer Tips, and on Friday our latest Bine updates. You’ll be able to choose 1, 2 or all 3 newsletters. Your email's safe with us. We don't spam. Thanks, Alli. Definitely. And better still, donating some of the food they grow to other people in need – the homeless, food banks ( – that’s a big thing here).